"For the life of a creature is in the blood, and I have given it to you to make atonement for yourselves on the alter, it is the blood that makes atonement for ones's life." "The priest is to make atonement for the whole Israelite community, and they will be forgiven, for it was not intentional and they have presented to the LORD for their wrong a food offering and a sin offering. The whole Israelite community and the foreigners residing among them will be forgiven, because all the people were involved in the unintentional wrong." 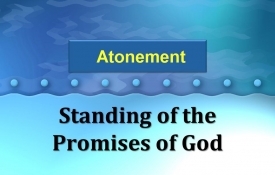 "I will established My covenant with you, and you will know that I am Yahweh, so that when I make atonement for all you have done, you will remember and be ashamed, and never open your mouth again because of your disgrace. "This is the declaration of the Lord GOD. My dear children, I write this to you so that you will not sin. But if anybody does sin, we have an advocate with the Father-Jesus Christ, the Righteous One. He is the atoning sacrifice for our sins, and not only for ours but also for the sins of the whole world.